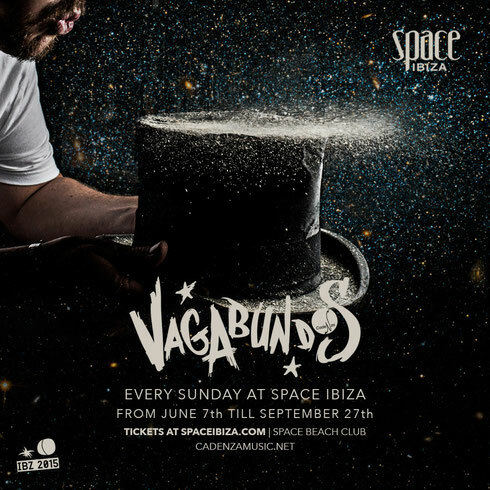 Vagabundos makes a comeback to Ibiza in 2015, taking over the Terrace at Space Ibiza every Sunday starting 7 June until 27 September. Regarded by some as one of the most successful and breakthrough parties ever to grace the White Island, the event will heat up the dancefloors in clubland once again with Luciano and his traveling gang of music gypsies ready to bring some fire in the Balearic nightlife. A brand new relationship between the Vagabundos concept and the multiple award-winning Space Ibiza club aims to change Sundays forever in Ibiza. A fusion between Cadenza’s famed Latin rhythms and the Space Ibiza sound system, plus the striking environment of its rooms, will bring a brand new music experience to the White Island. Riding high from the success of his recent ‘Grace Of An Art’ single for Cadenza (the milestone 100th release for the label), Luciano is looking forward to the summer, taking in a year of touring that has brought him all over the world once again with appearances at many major festival and clubs, in true Vagabundos style. A colourful extravaganza of beats and melodies, the new adventure for the Cadenza family will showcase the talents from their roster along with a list of guests.